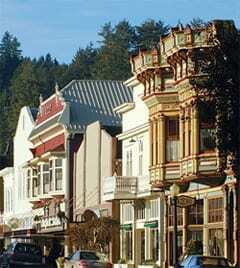 Located in the scenic redwood coast area of Northern California, Ferndale is one of the best-preserved enclaves of Victorian architecture on the west coast. Ferndale remains a healthy working town with a Main Street lined with ornate Victorian commercial buildings that still functions much like it did during the Victorian period, with a hardware store, drug store, saddlery, mercantile, banks, hotels, and saloons. Ferndale is such a rarity; it has been used as the location for several movies, including the popular film, The Majestic, starring Jim Carrey. The Victorian Inn sits right at the head of Main Street, and from your second story room you can watch the daily activity of a small town at work. Ranchers coming in to the Post Office to get their mail and check up on the local gossip, kids smiling on their way to the candy store, and numerous sidewalk conversations among locals and tourists alike. When you come to visit Ferndale, you’ll want to spend a day exploring Main Street with its many unique shops. If you’re a chocoholic, make your way down to Sweetness & Light and grab a couple of Moo bars or a Daryl Bar. Where else but Ferndale would you find a candy bar named for the local UPS driver? There’s more to Ferndale than Main Street though, if you love Victorian homes and other historic architecture, be sure to allow one day just for driving around the surrounding farmlands. Due to Ferndale’s early wealth from the bountiful dairies, Ferndale and the surrounding communities boast some of the grandest Victorian farmhouses in the country. Just pick any road and you’ll be treated to interesting Victorian homes, wonderful scenery, and clean, fresh country air. Ready to explore a bit further? Take a tour of a cheese factory in Loleta, or a real “company town” in Scotia. Have dinner with a hundred of your closest friends at the Samoa Cookhouse. Take a hike in Russ Park or try to decide between the several National and State forests and parks that are within easy driving distance. Take a picnic lunch for an all day drive along the Lost Coast, one of California’s most scenic and remote coastal drives. Or for a really up close look at some really large redwood trees, don’t miss the Avenue of the Giants, where the trees are so close you’ll want to keep your hands in the car at all times. The Lost Coast is California’s only coastal wilderness, where no development or major roads come near the ocean. This wild and spectacular scenic drive is the closest you can come without a backpack. Leave from Ferndale on the Petrolia Rd. (the “Wildcat”). The road follows the coast for six miles near Cape Mendocino, then turns inland along the Mattole River. Keep going and you’ll wind up in the back of Humboldt Redwoods State Park, whence you can return via Hwy. 101. Allow 3-4 hours for this adventure. A 31-mile scenic alternate to Hwy. 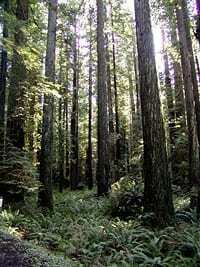 101, the Avenue of the Giants is the best bet for seeing the redwoods by car. Apart from stately aisles of massive trees, the Avenue takes you past inviting trailheads and side roads, as well as quirky small towns with their roadside attractions. 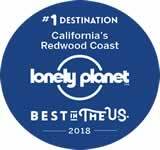 Must-sees along the Avenue include the Humboldt Redwoods State Park visitor center and Founders’ Grove (nature trail). Ever since there have been automobiles, people have wanted to drive them through holes cut in trees. Very well, if you must. The Shrine Drive-Thru Tree and Drive-Over Tree in Myers Flat, for a modest fee, will let you do it. Myers Flat exit off Hwy. 101. Come at the right time, and you’ll find excellent entertainment at the Repertory Theatre. But there really is no wrong time to come to Ferndale. It seems almost every week there is some special event, whether it’s the world famous Kinetic Sculpture Race, or the local favorite, Ferndale’s Lighted Tractor Parade at Christmas. Be sure to check our event calendar for the current happenings. The cradle of the wild and whacky Kinetic Sculpture Race, Ferndale continues to host the finish of this off-beat art event, now a three-day contest. What ever your choice is for your day’s activity, you’ll enjoy coming back to your luxurious room at the Victorian Inn. Cap your day off with an expertly prepared dinner at VI Restaurant, and then take another stroll around town to marvel at what the sky looks like when you can actually see the stars. Just for a minute, pretend it really is 1880, it won’t be too hard. Ferndale was the setting for the Jim Carrey movie, “The Majestic.” While the great Victorian architecture of Ferndale and the town’s beautiful location made it ideal, the crews did make a few adjustments to town. No detail was overlooked to create the perfect 1951 setting. First, they renamed the town Lawson. Then they went to work constructing new buildings on vacant lots, new buildings in front of existing buildings, and new buildings on top of and around existing buildings. All the businesses on Main Street got new signage and period window displays. Streetlights and traffic markings were changed. Period cars and trucks were rounded up. After filming, the construction crews came back in and started dismantling the sets, so now all of these buildings are just memories!